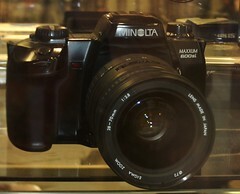 This particular Minolta AF SLR camera was identified as a "Dynax 600si Classic" in Europe, "Maxxum 600si" in North America, and "Alpha 507si" in Japan and Asia. For brevity in this article, it will simply be refered to as the 600si. Released in 1995, the 600si quickly assumed cult status. Instead of push buttons and menus that had become the norm for this kind of camera, the 600si was equipped with knobs and dials. It became known as the AF camera for people who liked older style SLR's. A version with a panorama feature (that masked the film plane from 36x24mm or 1.5:1 aspect ratio to 36x12mm or 3:1 aspect ratio) and a quartz date back, was released as the Maxxum/Dynax 650si. A vertical control grip was also available. With this camera, Minolta introduced a new user interface system that was a throwback to the cameras of yesteryear. The current philosophy of that time was to manipulate the camera controls via menus and button or dial combinations. Minolta's own rugged 9xi was an example of this. As good as that system was, there was an increasing demand for a camera that was easier to use. Thus came the 600si. Like cameras of the past, this one had each dial assigned to perform one function alone. There are separate knobs for flash and exposure compensation, drive mode, and exposure mode. Rotating switches on the back controlled AF and metering modes. Its control interface became so popular that it set the design precedent for some later Minolta, Pentax, and Canon SLR's. The Maxxum/Dynax/Alpha 7, 7D, 5D, 9, and 9Ti, are direct descendants of the 600si as is Sony's A100. 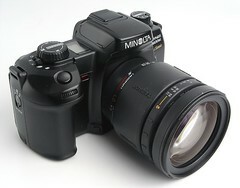 The design also influenced Minolta's Dimage cameras. The interface designs of other cameras such as the Pentax's MZ-5 and 5n (plus others), and Canon's EOS Elan II/50 and 7 series were also influenced by the 600si.